Non-Paleo: Lectin content of green beans vs. dried beans? In a podcast by Robb Wolf, he gives the OK on green beans as a food source, despite them being a legume. http://robbwolf.com/2010/01/26/the-paleolithic-solution-episode-12/ He said that the lectin content is pretty low and isn't much of an issue. I was wondering if there was any documentation out there illustrating the differences in lectin amounts between say green beans, and sugar snap peas, versus black beans, kidney or lima beans. Ideally, I would like us to formulate a chart that quantifies the lectin content of the various categories of beans, so we can see the difference between say Kidney beans and French green beans. Very good question, puts my mind at ease. I've been growing pole and bush beans on my back porch railing for years, and am glad to find they're as safe as they seem. Also, green beans contain only 1000mg/kg of saponins, in the lower range of dried beans. Some beans are as high as 4100mg/kg of saponins. That is a great answer, I may hold out to see if anybody wants to try and find any detail from the paper that David M. linked to. That article is locked behind authentication. Do you think you could provide some samples of the data for us to look at? @Matthew -- Wow. That is amazing, in-depth well-thought-out answer. (Not being sarcastic BTW) Were I David Csonka, I'd give you the bounty. I'm hoping we can come up with some kind of quantitative data. Like the chart on grams and types of sugar at http://thepaleodiet.com for various fruits and carbs. PS I personally think eating some green beans won't hurt- they taste great raw out of the garden! David, It is @PaleoHacks PS I also voted your question up. Patrik, what is your twitter account? @David -- Aaarggghhh! I just ran out out of votes. Apologies. Will post this question on Twitter. I'm looking forward to solid answers, too, since I love the stuff and grow my own. Nothing that tasty can be bad, can it? I think you may be out of luck getting a good answer to this question if you want a chart comparing levels. The term lectin is generally used to describe defensive plant proteins that bind to specific sugars. There are hundreds of different known types of lectins consisting of different proteins in many different groups of plants. Phytohemagglutanin in kidney beans is the best known type as it are the one that regularly poison people. It is also found at varying lower levels in other beans. Peanuts have a different type of lectin. It would be possible to quantify the levels in dried beans of many varieties as these are the only ones really studied. I cannot find any research on the lectin content of immature beans and bean pods like green beans or sugar snap peas, only levels in the dried mature peas. It is known that they do contain the same lectins at lower levels than the mature forms and too low to cause acute poisoning. However there are reasons I think it may not be that useful to catagorise them all. How easy are the lectins degraded by cooking? this could be more important than raw levels. To what extent do different lectins bind to the gut and are absorbed? Do lectins all have the same effects? Comparing levels of the different snow pea lectin to kidney bean lectinmay not be relevant . There is almost no research into the effects of these lectins in living organisms rather than blood cells. We just don't know very much about them in terms of human health. But in answer to your main question: Immature green beans and snap peas have been eaten raw for a long time with no poisoning. Their lectin levels are propbably quite low. Normal cooking may not reduce green bean lectins, kidney bean lectin takes 10 minutes of serious boiling to reduce it. I personally don't worry about eating green beans and peas raw. Sorry not to have a better answer. Many plants contain defensive lectins, some harmful or have no effect on us and some may even be beneficial. Its a complex topic. Mg of lectin per 100 mg of flour. Phaseolus vulgaris. Varieties are shown in bold and cultivars (garden varieties) listed for each. All native to the Americas. *All other pinto bean cultivars have high levels of lectin. **An old heirloom variety you will not find in shops. Anasazi beans ??? no level given but the lectins are probably not toxic to humans. Broad or fava bean (Vicia faba). Native to Africa and Asia. Couldn?? ?t find any lectin content levels however the lectin may help prevent colon cancer. Peas (Pisum sativum). Native to the Middle East. Contains Pisum sativum agglutin lectin. No levels known. Note lectin levels: There is no way of knowing what cultivar of each bean type you are eating, there are many cultivars of each grown. Snap peas are fine to eat raw but a handful of kidney beans eaten raw can kill you. Both have similar level of lectins when mature. The lectins are of different types and snap peas are eaten when immature. But the difference between the lower and higher levels is about 1.6% to 2.5% on average, so it's an open question whether it's significant enough to worry about, aside from the beans which are completely clear of lectins. There are three commonly known types of green beans: string or runner beans, stringless or French beans (depending on whether the pod has a tough, fibrous "string" running along its length), and snap beans, with a thin flat pod that requires less cooking time. Compared to the dry beans, they provide less starch and protein, and more vitamin A and vitamin C. The green beans are often steamed, boiled, stir-fried, or baked in casseroles. Pinto bean toxicity is very real-- I remember very well. Back in college, I ran out of money during a late night cram session and ate a 10 or 12 oz jar full of raw, soaking pinto beans. Within an hour I fell hard asleep-- MUCH harder than with sleeping pills. A few hours later I woke up-- vomiting. The subsequent dry heaves lasted for what seemed like half an hour-- no hangover compares. Ditto the dizziness-- it really did seem like the room was spinning in circles-- again, well beyond any alcohol effect. PS-- teachers often use dry beans for counting projects with children. The word about lectins haven't made it around very far yet. As Matthew said above, the green runner bean pods are safe, but unfortunately they can not be found easily in the US. I have gone to several veggie markets and I couldn't find them. In the Bay Area, I did find them at Draeger's though, at one time only. Here in the US I can only find easily the "long stripe" green bean pods, which I assume are as safe, just not as yummy (they're mostly used in salads). I'm originally from Greece, and there we mostly use the runner bean pods variety, not the new stripe salad ones. Before Paleo I used to have IBS and therefore a sensitive gut, but these green bean runner pods never created a problem. So I'm guessing their lectin levels are indeed way lower than dried beans/lentils, as Matthew mentioned. 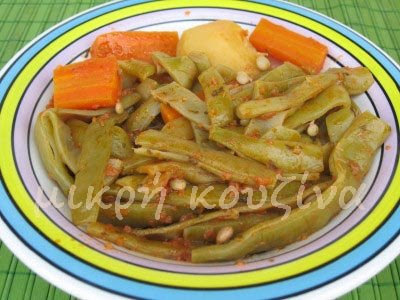 You can see how green runner beans ("fasolakia" in Greek) look like here: http://4.bp.blogspot.com/_Tn9XQasFmfU/Sgxt_0Pui0I/AAAAAAAARWk/JBiHYniE-4Q/s400/fasolakia8.jpg They are flatter and wider than the stripe salad green beans.